On Friday, a Ukrainian man allegedly tried to hijack a plane headed for Turkey and redirect it to Sochi in hopes of securing the release of anti-government protesters imprisoned in his country. 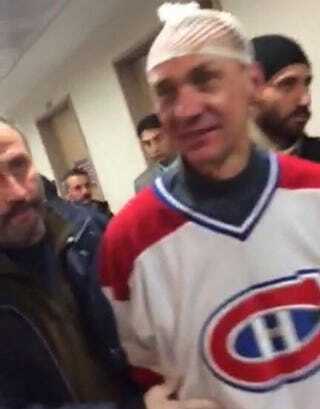 His attempt was foiled and, for some reason, he was wearing a Montreal Canadiens sweater when he was arrested. He also may have been drunk and/or high. He may not have totally thought this one through. Ukraine is in the middle widespread civil unrest in part due to its relationship with Russia. Ukrainian President Viktor Yanukovych was meeting with Vladimir Putin during the Olympics so, according to Maxim Lenko, the head of Ukraine's Security Service's investigative division, the man planned on diverting the plane to Sochi. It's unclear what he would have done once he arrived. "The passenger put forth the demand to free the 'hostages' in Ukraine," Lenko said, in reference to people arrested in the ongoing protests in Ukraine. "Otherwise, he threatened to blow up the plane." Turkey's private NTV television quoting an unnamed passenger on board the plane said the man was demanding freedom for prisoners in Ukraine as well as former Prime Minister Yulia Tymoshenko, who is Yanukovych's top foe and serving a seven-year sentence on charges of abuse of office. His plan was doomed from the start. The flight's crew tricked him and continued on its original path to Istanbul. Instead of diverting the plane to Sochi, they stayed the course and simply told him they were going to Sochi. Once in Istanbul, he soon realized he was not in Sochi and found himself in an hours-long standoff with Turkish authorities. He was eventually "subdued by security officers who sneaked on board" while he spoke with a negotiator. Turkish authorities did not find a bomb.